In this article, you will (1) find stories of persecuted Christians; (2) discover the existential threat to Christianity in many parts of the world; (3) and you will learn how you can support the suffering church in these perilous days in which we live. Rescue those being led away to death; hold back those staggering toward slaughter. (Proverbs 24:11 NIV) While much of the world watches in deafening silence, countless numbers of Christians face severe persecution. Churches are routinely destroyed and the personal property of Christians is confiscated. Many others endure intimidation and ongoing extortion. In addition, Christian homes and communities are burned. Kidnapped women and children are either forced to convert to Islam under the threat of death, or sold as slaves. Merely owning a Bible is a crime punishable by imprisonment or even death. Furthermore, extreme physical violence, including amputation, is the norm. And tragically, beheadings are now a daily reality for thousands of our brothers and sisters in Christ. The International Days of Prayer (IDOP) for the Persecuted Church are times of global intercession for our oppressed family in the Lord. Suffering Church Action Week (SCAW) is a time for Christians worldwide to unite in solidarity, rise up and rescue our persecuted family. The Apostle Paul taught us that when one part of the Body suffers, we all suffer. (1 Corinthians 12:26) The enemies of the cross do not care about our socio-economic status, political affiliations, or any values we hold dear. To them, we are all filthy infidels and are worthy only of subjugation or death. For us in America, it's hard to imagine being arrested and sentenced to a flogging of 80 lashes for the "crime" of taking Sunday communion. Yet, this has happened in Iran. Be warned, the simple act of taking communion is hazardous to the health of all who live under Islamic Sharia law. Still, far worse than this takes place daily. 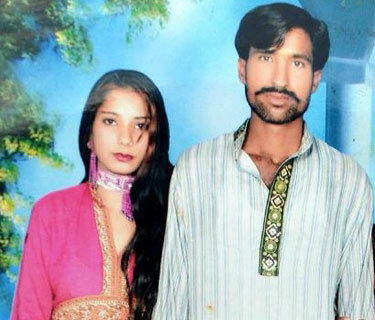 On November 4, 2014, a Muslim mob in Pakistan burned to death a young Christian couple. Their alleged crime was blasphemy; or more specifically, burning a Quran. Shahzed Masih and his pregnant wife Shama Bibi worked and lived at a brick kiln for the previous 13 years. However, on the day before their murder, while cleaning the house, Shama found some papers that belonged to her late father-in-law. Shama, who was illiterate, gathered the papers and burnt them all. Her Muslim neighbors, who saw her burning the papers, accused her of burning a Quran. Whether or not she actually burned a Quran is still unclear. However, if a Quran was indeed included among the papers, she would not have known this since she was illiterate. The neighbors informed the manager and owner of the brick kiln who then locked the couple in an office so they could not leave. Word soon spread to the village mosque that a Quran had been desecrated. And from there, messages went out to six or seven adjacent villages. Subsequently, loudspeaker announcements from local mosques condemning the couple quickly gathered an angry mob of more than a thousand Muslims. Descending on the brick kiln, they surrounded the office where the couple was being held, and ripped open the building's thatched roof and threw bricks at the couple. The mob then beat the couple with clubs, breaking their legs so they could not run. While begging for mercy, the mob dragged them to the top of the brick kiln and put an iron sheet on them in order to keep them from moving while being burned alive. Shama's clothing was made of a material that initially didn't burn, so they removed her from over the kiln and wrapped her in cotton so she would catch fire more easily. After their clothing caught fire, the mob threw each of them into the furnace with shouts of “Allahu Akbar” (Allah is great). The Christian eyewitnesses also told that the Muslim mob burnt a Bible and threatened to burn the church and Christian houses in the village. This all happened simply because a young mother of four may have accidentally burned a Quran. This is all it takes to incite Islamic rage. The family of Shahzed Masih and Shama Bibi were only able to recover bone fragments and ashes of their loved ones. I am distressed by the thought of the International Days of Prayer passing by unnoticed by a large segment of the American Christian population. No doubt, some Christians rely solely on the secular media for news and information. Those individuals may actually be unaware of the extreme suffering endured by Christians across the globe. But how many simply look the other way to avoid the inconvenient truth of persecution? Still, others just don't care about issues that do not directly affect them. Let us consider the example set by Yeshua (Jesus) as we approach the International Days of Prayer. Yeshua (Jesus) prayed that His Father would protect His disciples from the Evil One. (John 17:15) Knowing adversity would soon come, Yeshua (Jesus) prayed for His disciples. As followers of Yeshua, should we do any less for persecuted Believers? Moreover, when Yeshua (Jesus) taught His disciples to pray the all too familiar “Lord's Prayer”, His opening words were “Our Father.” We are one family since we have the same Father. Will you pray for your family? On behalf of our persecuted family, I thank you in advance for joining in prayer, and for your generous acts of compassion. To find specific prayer points and concrete actions to take in support of our persecuted family, please continue reading.